"It looks like Pomona. They used to race clock-ways in the beginning years. Later the direction of travel was reversed. On the other hand it might be Del Mar since the 550A must have been delivered mid-to-late 1957 and the Pomona race direction was changed mid-1957. 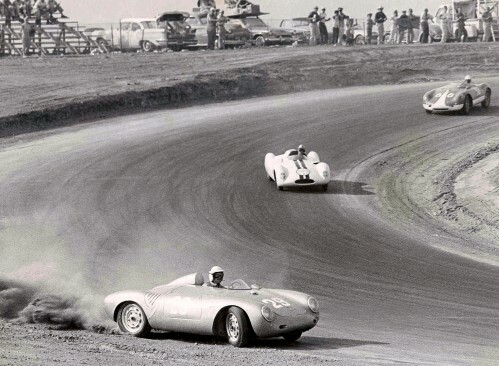 One thing for sure Car #29 is Joe's second Spyder, he totaled his older 550 at Willow Springs. Car #88 is BIG Jack McAfee, who I met for the first time at VARA's last Irwindale tech inspection. Car #49 is Bob Drake standing next to Joe Lubin's Cooper-Climax 1500." "I just talked to Joe Playan: He said Ron is 200% right. He knows his stuff. Joe wrecked his first spyder at Willow testing on Friday -- he was knocked out and had a concussion and didn't wake up for three days." Joe loses it in Turn 7, maybe because his Pirelli tires had "gone off". See below. Drake and McAfee follow. 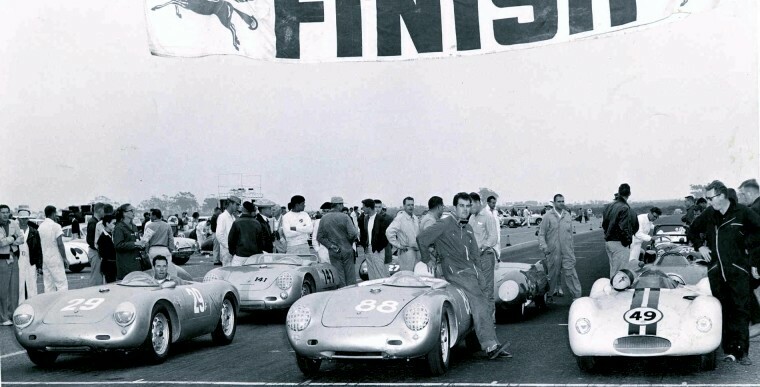 This is September 22, 1957 -- and race winner Ricardo Rodriguez hasn't come into the picture yet. "Joe was leading the Sept. 22, 1957 Riverside race over McAfee and Drake and Rodriguez. He'd taken the Continental tires off the Porsche and put on Pirellis and they went away on him and he lost the race. Rodriguez won and Drake was second. Joe came third and McAfee was fourth. Joe later put the Continentals back on and won several races."